Gorman-Rupp's 7' x 10' (2.1 m x 3.1 m) Above Ground Pressure Booster Station is a complete system, ready for immediate installation and hookup to power and piping. The low silhouette and color of the Quonset-type fiberglass enclosure blends in with surrounding landscaping. The fiberglass enclosure resists corrosion, mildew, fungus and mold. Two-way sliding cover provides easy access to all equipment for maintenance or service. Vandal resistant door hardware and lockable sliding cover are standard for added security. Dependable Station Controllers engineered to meet your requirements have a variety of adjustable pressure controls, H-O-A selectors for each pump, overload reset buttons and circuit breakers for station accessories. Automatic controls operate pump functions and warning systems. All field connections are clearly identified for fast and efficient electrical hookup. Booster Pumps used in our packaged stations are designed for long lasting and trouble-free use. 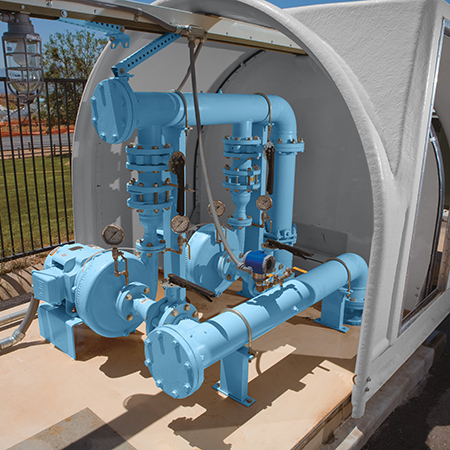 Whether your engineered system requires vertical in-line, end suction, split case or vertical turbine pumps, you can depend on our durable design.